Govind Negi, Director of Talent Engagement at 3Pillar Global, will be a panelist for a discussion on “HR in the C-Suite: Assuring a Aeat at the Table” at HR Symposia 2017 in New Delhi, India on 23rd September 2017. Govind and fellow panelists will discuss “The Challenges HR Professionals Face In The Role Of CHRO.” Their talk will help attendees understand the challenges an HR head of today’s global companies face and the priorities they have to set. They will also delve into questions like how can a CHRO help a CEO in growing the organization? 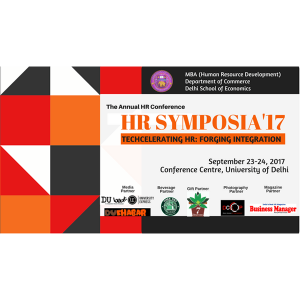 HR Symposia is a 2-day annual HR conference organized by MBA – Human Resource Development, Department of Commerce, Delhi School of Economics, University of Delhi. It is aimed at developing industrial awareness and interpersonal skills among students in today’s global and dynamic business environment. Eminent HR Professionals share their insights with students, raising student awareness on current HR topics and initiating corporate-student interaction. The theme for 2017’s conference is Techcelerating HR: Forging Integration, and it would be held at Conference Centre, North Campus, University of Delhi on 23rd and 24th September 2017. For more information on the conference and how to register, visit the official conference website.